Jaspreet Bindra is the founder of Digital Matters, a digital transformation and technology advisory. Until recently, he was leading digital transformation for the $20bn Mahindra Group, and now is the Digital Advisor to some of their companies. He is Adjunct Advisor at IDC, and in the Advisory Board of Findability Sciences (a Softbank company), Blockchained India, a Fellow at Design Thinking firm QGlue, and an advisor at multiple other technology companies and start-ups. He teaches digital transformation and blockchain at several US university executive programs, and has lectured at INSEAD. He is also in the Leadership Team of Singularity University, Gurgaon Chapter. Jaspreet writes, teaches and speaks extensively on the above topics in leading Indian publications, Indian and global conferences and in academia – HBS, ISB, INSEAD, IIMs, IAMAI, CII, FICCI, ET GBS, etc. . Jaspreet was the Vice Chairman of IAMAI, an Evangelist for the Mobile 10X program, on the Advisory Board of SPJIMR, and a Charter Member of TiE. 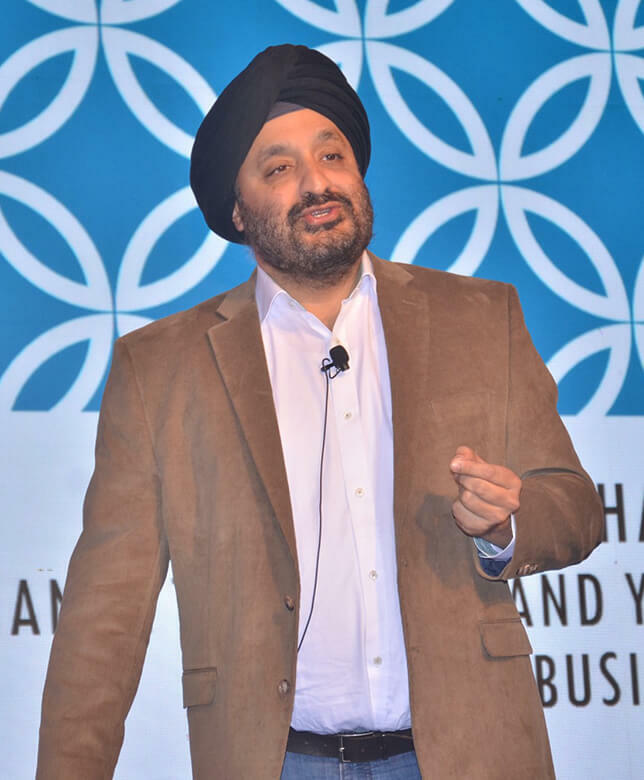 Before the Mahindra Group, Jaspreet worked at Microsoft, was an entrepreneur himself and was a part of the elite Tata Administrative Services in the Tata Group. He is very active across the tech start-up ecosystem, and has invested, advised, mentored and incubated multiple deep-tech and blockchain start-ups. SAP and Mint crowned Jaspreet the inaugural ‘Digitalist of the Year 2017’. Through his extensive digital transformation experience, he has driven the transformation of diverse legacy companies (Agri, Auto and Manufacturing, Financial services, Real Estate, Hospitality, Retail, Software, etc.) to digital business models and mindsets. He was one of the first practitioners to embrace Blockchain, with his team creating a few PoCs (Proof of Concepts), one of which is being built as an enterprise platform. He is an acknowledged expert on digital transformation and disruption in large businesses, blockchain and cryptocurrency and the future of work. He is also a technology futurist, predicting digital and technology trends and how they will impact businesses and life. His sessions brim with useful takeaways that the audience can apply into their businesses and make changes on the go. Specifically on Blockchain, Jaspreet does think that there is some irrational exuberance in crypto (especially bitcoin, though he is invested in it and also in Ether); but he strongly believes that the underlying technology, blockchain, has the potential to change the world as much as the Internet did! He also believes that blockchain (and AI) is a philosophy as much as a technology, and can have massive applications in Supply Chain, BFSI, Manufacturing, Energy, Auto, etc. His assertion is that the most fundamental impact of blockchain will be in government, and it has the potential to create a friction-less, corruption-less government! His TEDx talk on Blockchain at has raced past half a million views, and growing. His first book on digital transformation, technology and how they will shape enterprises, The TechWhisperer, published by Penguin Random House, will be released later this year. Jaspreet is an avid quizzer, having been the only one to have won the Brand Equity Quiz thrice nationally, and collects Gin - he believes he has the largest collection of gin in India.